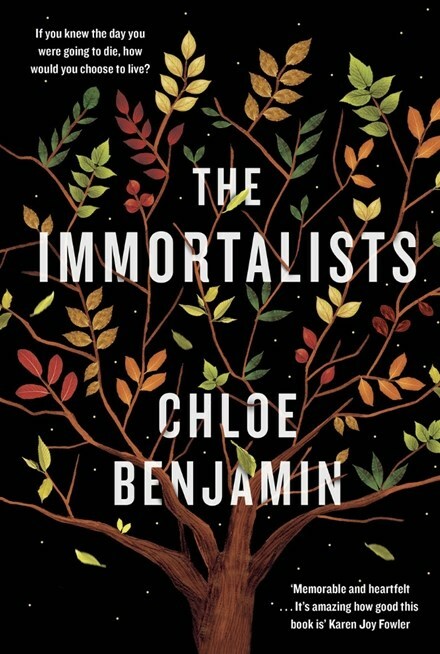 Chloe Benjamin’s new novel The Immortalists is a historical family drama with a conceit at its centre which starts as intriguing, develops as character building and then starts to drag on the whole enterprise. In 1969, four children, ranging in age from thirteen to seven and intrigued by stories running around their neighbourhood go to seek out a local fortune teller. Despite having scraped together their savings the woman, for no fee, purports to tells each of the children the exact date on which they are going to die. This event, and the knowledge it brought, will shape the lives and the decisions of the four and spark a furious internal debate in the novel between fate and free will. Each section of the book focuses on a different one of the children, in age order from youngest to oldest. When his father dies, Simon, seven when he is told his fortune and now fifteen, breaks away from his mother and the expectation that he will take over the family’s New York tailoring business. He runs away with his sister Karla to San Fransisco where he explores his gay identity in the heady days of the late seventies. This is the most effective section of the book, capturing both an explosion of freedom and the creeping dread of the AIDS epidemic from a time before it even had a name. The following sections focus first on Karla, seeking to be a performer of magic and illusion while also trying to be a mother and battling mental illness. Then Daniel, contemplating his own ethics as a doctor while also challenging the fate that was predicted for him. And finally Varya who has dedicated her life to the study of longevity. Where the novel falls down a little is in the impact of the Romani woman’s predictions. While Simon’s decisions make some sense in this context (although he might have made them anyway), the behaviour of the others – Karla to some extent but Daniel in particular – in dealing with their supposed fate is completely inexplicable. And despite a fairly upbeat ending, the spectre of impending death of each character leaves the story whole feeling a bit like of a series of mainly avoidable tragedies. But there is plenty to like about The Immortalists. Benjamin threads through American history from the late 1970s through to the early 2000s. Besides the underlying themes of destiny versus free will she deals with plenty of other issues from gay rights through American military recruitment practices to animal rights. The characters, their tales and their challenges, are all very different but the bond between the siblings feels strong through the narrative and creates an engaging family saga.